Hi, I am interested in your 1969 Chevrolet C/K Truck (stock #CJNT047) listed on Autotrader for $18,900. I'd like to get more information about this vehicle and confirm its availability. 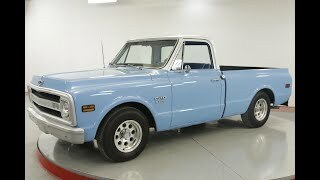 Worldwide Vintage Autos is pleased to present this 1969 Chevy C10. California truck since new. Original POS card from original owners and owner manual! The C/K was Chevrolet and full-size pickup truck line from October 1959 until 2000 in the United States and Canada, from 1964 to 2001 in Brazil, and from 1975 to 1982 in Chile. From 1959 to 1987, C/K was also the name of GMCs truck series; it switched to the name Sierra from 1988 to 1999 while sharing the C/K platform. The first Chevrolet pickup truck was introduced in 1924, though in-house designs did not appear until 1930. C indicated two-wheel drive and K indicated four-wheel drive. The aging C/K light-duty pickup truck was replaced with the Chevrolet Silverado and GMC Sierra names in 1999 in the United States and Canada, and 2001 in Brazil; the Chevrolet Silverado HD and GMC Sierra HD heavy-duty pickup trucks followed. Until this time, the names Silverado and Sierra were used to identify the trim level of the C/K trucks.